Fighting to end chronic hunger in Zambia, create jobs, ensure water supply and support kid's education. You guys all know that PAF basically started with planting fruit trees and handing thm out to people in need. Of course back then we set up a greenhouse to protect the saplings. This one was, how can I say…quite improvised and by far too small for our needs. So one of our major goals for 2018 was to get a better and bigger greenhouse, and have it close to PAF Center. All that is easier said than done. A lot of research was needed on how to construct the new one, what kind of shade netting to get, what kind of poles etc. … Wesley and the guys have been running up and down to get the necessary info and samples of the materials. So now the construction of our new PAF greenhouse has started. This time it is supposed to be much longer lasting and more professional. After all that it took a massive amount of hard work and even more teamwork. Everybody helped cementing the foundations of the poles, puzzling all the pieces together and last but not least painting the poles in a stylish green and grey colour. You know the deal. You are home and feel like eating that special fruit or chocolate or you realize you forgot to buy soap. What do you do? You just get outside walk or drive a few minutes and get what you need or desire. Well…it doesn’t really work like that in Zambia. Especially in rural areas like Chinkonono. There is a very small shop in the next village, but honestly speaking…it by far doesn’t have all our villagers need. So the only solution is to go to Kalomo. But the trip to town for groceries takes the whole day and you always have to add transport costs and hope for someone to pass by and take you there. There was a lot of work to do to actually make that room look like a shop. Sonic, Scout and Wesley have been constructing a counter. Our new carpenter Jonsen has been making some nice shelves. And everybody helped cleaning and painting inside. All that took our PAF members about 3 days. Congrats, guys! You did a great job. Thank you so much for all your hard work you put in! Now we are trying to come up with a smart way get the initial kickstart for stocking up with useful and desired items. Very soon our little shop will be running. A lack of soap, salt, matches and basic stationary items will be a thing of the past. And who knows…maybe we will also offer some sweets for the kids and some cakes and other “luxury” items as well…I hear the birds tweeting such sweet rumours alreaedy 😉 We will keep you posted and definitely let you all be part of the big opening! You guys all know what it is like: you just feel an itch and wanna go buy some stuff or go window shopping. All that is impossible in Chinkonono. You eat what you grow, you wear what you sew or can get on rare occasions in town. The next shop is about 6km walking distance away. And you know…the items you buy will have to be carried back home again. So PAF decided to re-use the sewing room and make it a shop. Wesley nd the rest of the members kickstarted this whole project. Shelves have now been carpented and will be set up in the next few days. Once the shop is all set up our members will sell tomatoes and veggies, bread and maybe cake, the clothes and bags we sew. Step by step we will try to widen the range of products. But to do so we need to find out what people are interested in. Hopefully the shop will attract and draw more people towrds PAF Center. But it certainly will save our villagers lots of time and effort. Time flies, folks. Bruni is already back from her 10-days trip to Chinkonono. We are currently working on another slideshow for you guys to see what happened and also some other cool surprises. But what we can do for now to make the wait worthwhile we want to show you a little tour around PAF Center. Bruni will guide you around and talk about it. It is in German language, but we added the English subtitles for you guys. Hope you enjoy and are as proud as we are about what happened there in the past years and how far we have already come. Three years ago Chinkonono had no real center at all. Things and places throughout the village were widely spread and people would only gather at houses to do business. 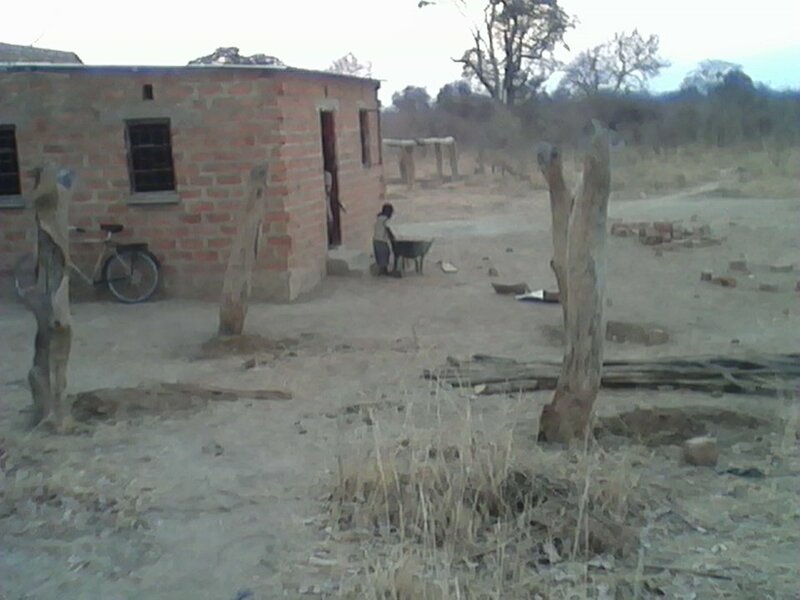 Chinkonono had to rely on other villages and town (Kalomo) for its daily needs. People had to go to Nguba to mill their maize and buy groceries such as salt, sugar and soap. They had to go to town to get their clothes mended and buy fruit tree seedlings. This drastically changed and is no longer the state of affairs as Planting A Future has shaken things up. We have created a village center where people can access their groceries on PAF market place, mill their maize for little money with our own hammer mill or get their fruit tree seedlings. Also we now provide instructions on agriculture skills, such as horticulture and gardening. Quite a number of people from Chinkonono and surrounding villages visit PAF Center. Of course you can imagine that this was impacting the environment negatively and it had prompted PAF management to improve sanitation by constructing toilets, which will be used by both, PAF personell and clients. So we have been working hard on constructing a building for the toilets, making bricks and plastering. To be precises, we are talking about 2 semi-waterborne latrines with nice porcelain toilet bowl. PAF members will make sure the toilets will be kept maintained and cleaned at all times. Finally! Julie made it back to Zambia after 2 years. And guess where she went: Chinkonono Village of course! Julie had a big To-Do-List to check 😉 As you know we have been announcing a market place and kitchen for ages. So we planned to get both structures roofed within that week. We managed for the kitchen. So that is good. The market we only could do half because we lacked grass to that the roof the traditional Tonga way. But we are confident that it will be done very soon. Also our building that houses the library and sewing room for now was supposed to be painted nicely. Unfortunately there was a lot of plastering to do to fix dents and window sills. But Jason and Albert worked hard. So with a slight delay the ladies, Julie, Wesley and many other hands could start painting. For the rooms we chose water-based white paint and for the lower part white oil paint so we can wash of prints of dirty kids’ hands 😉 Door and window frames are painted in a dark green. For the front wall and pillars outside we chose white oil paint to be able to wash them too. Also Wesley and Julie practiced their sign writer skills and wrote Planting A Future onto the top part of the front wall. What can I say? It looks beautiful and bright and people can see it from afar. Our members are so proud, especially the women. They say that nobody has a nicely painted wall our house at home. And to quote Media: “Not all men’s work has to be done by men only. We can do that too!”…she refers to the whole painting job, which was very interesting and exciting for our ladies. African markets….what image do you have in your mind when you think of an African market? Bright colours, smiles, women carrying baskets on their heads, lots of people rushing through, bargaining and talking, laughter, animals running around…well, fair enough. It is not that far off reality. In African societies a market is a place where people meet and interact. It serves as the socialising agent and fosters togetherness. While its primary objective is to provide a place where people can trade or buy and sell products and services, a market is a very important aspect of communal life. In our village, people have to walk several kilometers to Nguba and Singwamba to sell or buy basis products like soap, salt , food and medicines. This will be a thing of the past as a communal market is under construction at our PAF center. 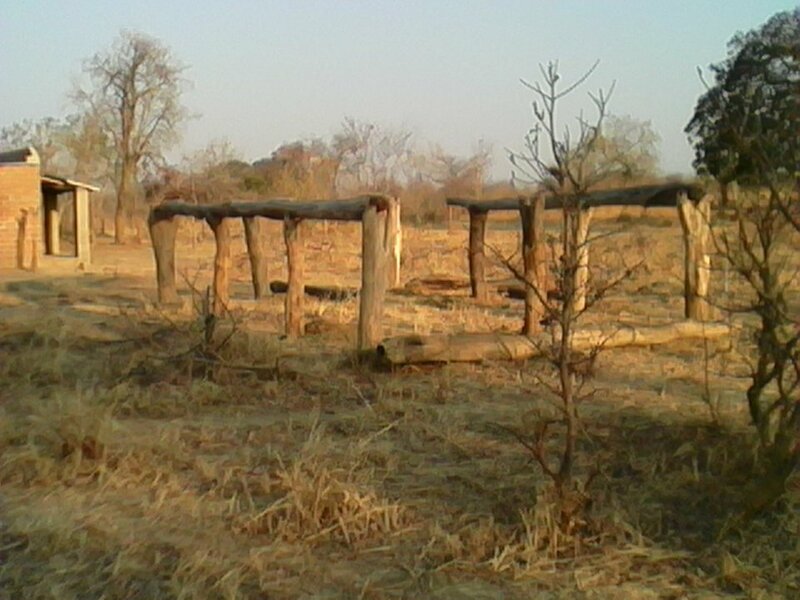 We are building it, using local materials such as logs, grass and mud. It will be made of Mubanga Tree logs or Iron Tree so that the market building can last for more than fifty years. Quite a bit of work is going on as you can see in the picture. Our technician on the site, Mr Epheso Mulwani, is busy mobilising PAF members and volunteers to build the market…and working on it together is the first step of creating a communal togetherness. It will be “our” market and people will be even more proud of it once it is finished. Knowing we talk about Africa I wouldn’t rely on the 8 days 😉 But we will push things to finish it as soon as possible. Please check back on our blog and see how we do it here in Chinkonono. We will keep you posted.